Floppy Days Vintage Computing Podcast Episode 8 - TRS-80, book mentions, and an upcoming interview! Episode 8 of Randy Kindig's Floppy Days Vintage Computing Podcast, entitled, The TRS-80 Model I (Part I), gives another shout-out to two of the upcoming books I've co-authored, CoCo: The Colorful History of Tandy's Underdog Computer and Vintage Game Consoles: An Inside Look at Apple, Atari, Commodore, Nintendo, and the Greatest Gaming Platforms of All Time. Though Kindig messed up our names again (they're not easy--we've since given him a pronunciation guide), his support is of course still much appreciated. Kindig will also be receiving review copies of both books for future episodes of his podcast, plus he will be interviewing Boisy and me on an upcoming podcast (we want to wait for him to get a copy of the book). 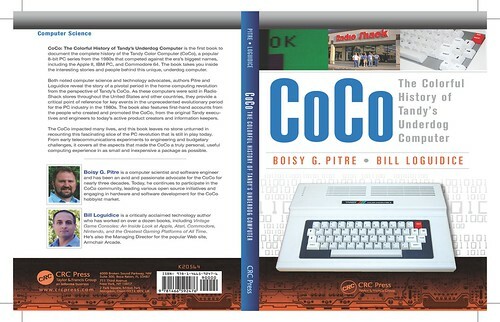 One other correction, the CoCo book should be out by the end of December, not November! Check out the episode here, which is part one of a two part interview with the authors of a popular TRS-80 book, as well as additional info on the computer itself. The TRS-80 was the first major personal computer Tandy did before the Color Computer (CoCo), and was part of the original 1977 trinity, which also included the Apple II and Commodore PET.